From clouds to rain and back again, the water cycle always amazed me. November is often a time of deep fog, grey cloudy days and heavy rain where I live. Even if I much prefer snow, I’ve come to really love the cloudy and rainy days. Seeing the streams of rain moving in the distance never fails to remind me of a countryside theater. They’re nothing better than a cup of hot tea and a little bit of knitting to enjoy the show from the outside elements. Thanks to Andi Gallegos for knitting the sample socks! Finished Foot Circumference 5 ¾ (6 ½, 7 ¼)” / 14.5 [16.5, 18.5] cm to fit foot circumference of 7 ½-8 ¼ (8 ¼-9, 9-9 ¾)” / 19-21 [21-23, 23-25] cm and an adjustable foot length. Wooly Wonka Rhiannon Sock (75% Superwash Merino, 25% Nylon; 465 yards [425 meters]/100 grams): Color Forget-Me-Not, 1 (1, 1, 2) balls. Thanks to Wooly Wonka for donating the yarn for Soaked to the Skin! 35 sts and 50 rows = 4” [10 cm] in St st after wet blocking. 40 sts and 50,5 rows = 4” [10 cm] in Clouds after wet blocking. 47 sts and 46 rows = 4” [10 cm] in Drops after wet blocking. 1/1 LC: Slip 1 stitch to cable needle and hold in front; k1; k1 from cable needle. 1/1 LPC: Slip 1 stitch to cable needle and hold in front; p1; k1 from cable needle. 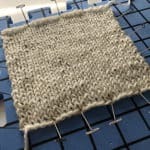 1/1 RC: Slip 1 stitch to cable needle and hold in back; k1; k1 from cable needle. 1/1 RPC: Slip 1 stitch to cable needle and hold in back; k1; p1 from cable needle. 1/2 LPC: Slip 1 stitch to cable needle and hold in front; p2; k1 from cable needle. 1/2 RPC: Slip 2 stitches to cable needle and hold in back; k1; p2 from cable needle. 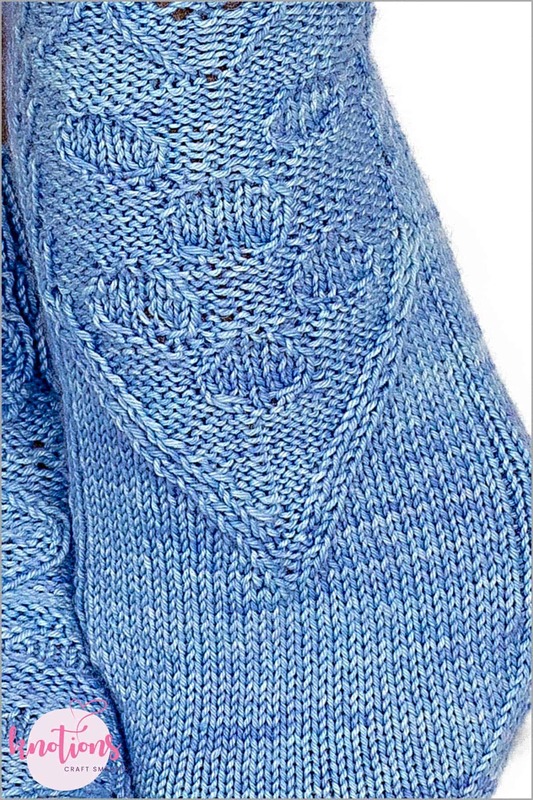 This pattern is written to be worked using magic-loop but can be adapted to be knitted with double pointed needles or two circular needles. 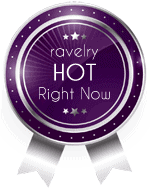 All stitches are slipped purlwise unless otherwise noted. For all stitch patterns, sizes M and L charts are combined into only one chart. For size M, only work the white stitches. For size L, work all stitches (pink and white stitches). Download the Size Small Charts as a PDF. Download the Size Medium/Large Charts as a PDF. CO 58 (66, 74) sts with an elastic CO and join to work in the round. The first half of the sts – 29 (33, 37) – will become the front sts of your sock and the second half of sts will be the back. The beginning of the round is located at the right edge of the back when looking at it with the right side (exterior) of the work facing you. S size: Work 16 rounds in ribbing as follows: *(p1, k1) 3 times, p2, (k1, p1, k1, p2) 3 times, (k1, p1) 3 times; rep from * all around. M & L sizes: Work 16 rounds in 1×1 ribbing as follows: *p1, k1; rep from * all around. Work Clouds stitch pattern across all sts until you reach the end of the Clouds stitch pattern. You will now be working flat, across the back sts, i.e. the last 29 (33, 37) sts of the round. Row 1 (RS): Sl1, *sl1, k1; rep from * to last st.
Row 2 (WS): Sl1, p across all sts. Repeat Rows 1-2 a total of 14 (16, 18) times, for a total of 28 (32, 36) rows. Row 1(RS): Sl1, k15 [17, 19], ssk, k1, turn. Row 2 (WS): Sl1, p4, p2tog, p1, turn. Row 3: Sl1, k until 1 st before the gap, ssk over the gap, k1, turn. Row 4: Sl1, p until 1 st before the gap, p2tog over the gap, p1, turn. Repeat Rows 3-4 for a total of 5 (6, 7) times. All stitches on each side have been worked. – 17 (19, 21) sts. Row 5: Knit across all sts. Your heel is now completed. You will now start to knit in the round again. Your working yarn is now located at the left edge of the back when looking at it with the right side (exterior) of the work facing you. Your back stitches will become your sole stitches and the front stitches will become your instep stitches. From now on, they will be referred to as such. Pick up and knit 14 (16, 18) stitches along the side edge of the heel flap (one in each slipped stitch). Pick up one extra stitch between the heel and the instep to prevent a gap forming. These picked up sts are included as part of your sole sts. Work Drops stitch pattern across all instep stitches. Place a marker for your new beginning of round and pick up one stitch between the instep and the heel to prevent a gap forming. Pick up and knit 14 (16, 18) stitches along the side edge of the heel flap (one in each slipped stitch). These picked up sts are included as part of your sole sts. – 47 (53, 59) sole sts & 29 (33, 37) instep sts. Finish the current round by working R1 of Gusset decreases below, this counts as your first R1 of the Gusset decreases. R1: sole = k to last 3 sts, k2tog, k1; instep = work Drops stitch pattern across all sts. R2: sole = k1, ssk, k to end; instep = work Drops stitch pattern across all sts. Repeat R1-2 a total of 9 (10, 11) times. – 58 (66, 74) sts. 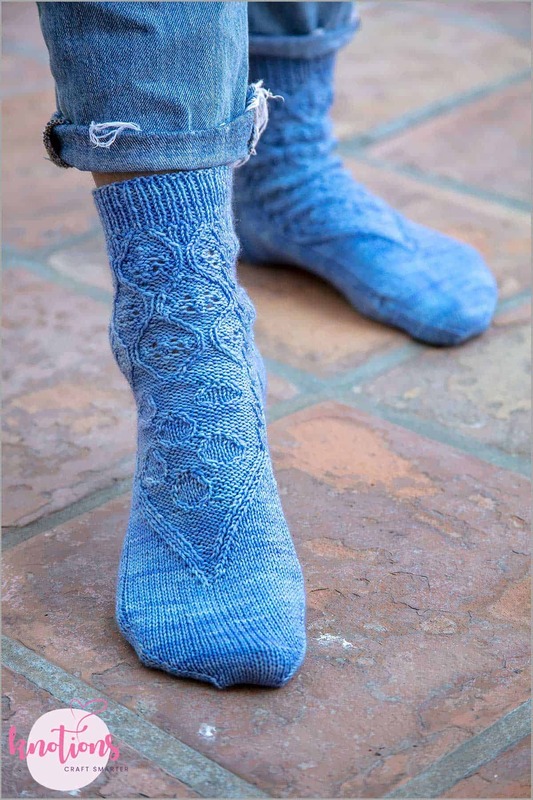 Work as established until you reach the end of the Drops stitch pattern or until the sock is approximately 1 ½ (2, 2 ¼)” / 4 [5, 5.5] cm shorter than desired foot length: sole = knit across all sts; instep = work Drops stitch pattern across all sts. 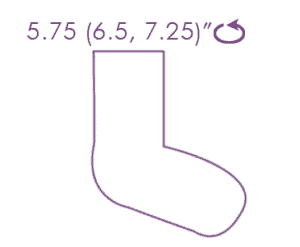 If your foot is longer than 7 (7 ½, 7 ¾)” / 18 [19, 19.5] cm, the sock is not yet long enough to start the toe decreases. 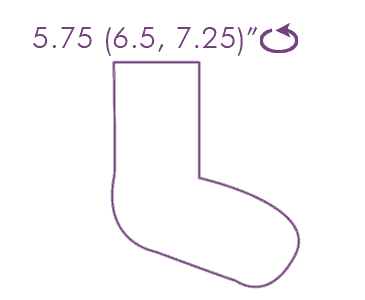 Knit across all sts until the sock is 1 ½ (2, 2 ¼)” / 4 [5, 5.5] cm shorter than desired foot length. Read the following instructions, then see Rounded Toes section below. 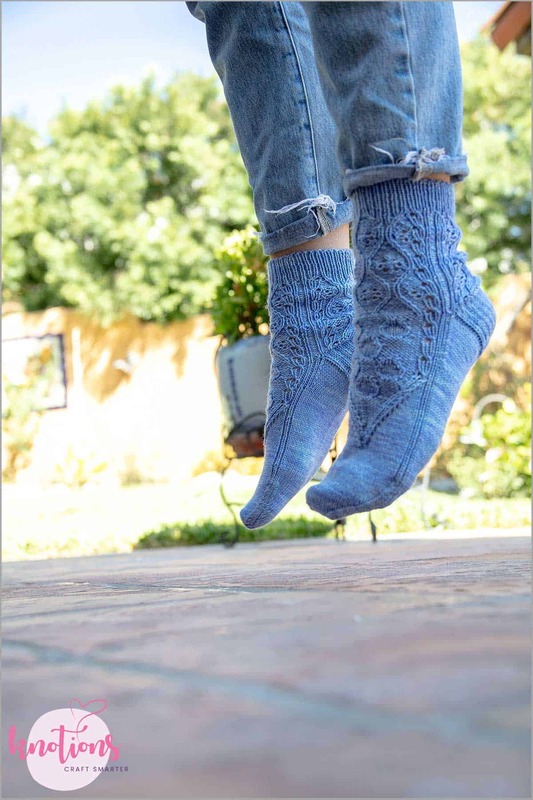 If you haven’t completed the Drops Stitch pattern yet, please do so while working the toes. If you have (and this will be the case for most of you), just work those stitches as knit stitches. Each decrease will “eat” a stitch at both the beginning and end of the instep. Be careful to keep the Drops stitch pattern aligned with the rest of the sock at all times. Plain Rnd: k all sts. 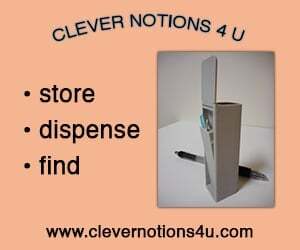 Work (1 decrease rnd, 1 plain rnd) 1 (1, 2) time(s). Work (1 decrease rnd, 4 plain rnds) 0 (1, 1) time(s). Work (1 decrease rnd, 3 plain rnds) 2 (1, 1) time(s). Work (1 decrease rnd, 2 plain rnds) 1 (1, 1) time. Work (1 decrease rnd, 1 plain rnd) 3 (4, 4) times. Work decrease rnd 2 (3, 4) times. – 22 (22, 22) sts. Graft the remaining sts using Kitchener stitch. Knit the second sock. Chloé comes from a family of crafters and learned to embroider at a very early age. It developed her love for thread, fabric, and yarn, which has not left her since. She rediscovered the joy of knitting in her studying years while she had to spend several hours on public transportation every day. She soon started designing her own patterns to play and experiment with colors and textures. 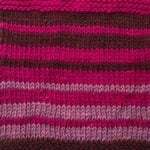 She focuses on original but simple patterns with a wow factor, as she believes every knitter can tackle any technique, if it’s properly explained. 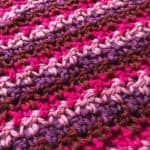 She is also a knitting teacher, helping knitters to conquer advanced techniques without headaches. She can be found at tisserincoquet.fr, on Ravelry, or hiding unexpected new additions to her stash in her secret closet.